And while last week was enjoyable, this week brings more playoff intrigue. This is the stuff that mattersas we move past the halfway point of the regular season. I hate his face. The grinch without makeup. Carolina and Pitt is the marquee matchup? Must be a bad week for matchups. I guess Bills/Jets wouldn't qualify. When was the last time we had a Thursday night match-up like this?! Corner, this should be a real good one that really will compete for my time with the Sabres. Vikings vs. Rams was excellent earlier this season with both Goff and Cousins lighting it up. I'll start with the Sabres in Montreal then stream TNF online when it starts. Stupid me. I watched that game and it was great up until close to the end. Yeah, two teams combined for 4 losses is awful. It’s a great Thursday game. I want to be fully in on the Sabre’s but every time I’m ready to commit, they lay a dud. It's easily the best matchup of week 10 and the Sabres will be interesting all season long with some ups and downs as they are still finding their way. Yeah, Eichel is starting to look like a franchise changer. I hope he stopped smoking cigs haha. Keep on smoking defensemen and I'm good. Can Carolina Shut Down Conner? If the Steelers win Thursday night, it'll be because of James Conner and their run game, according to Elliot Harrison. See his prediction for tonight's matchup as well as his game picks for the rest of Week 10. I don't like the Panthers on a short week. Carolina darn near gave up a 35-7 lead last week at home to Ryan Fitzpatrick. Ben Roethlisberger threw effectively in Baltimore, despite the absence of massive numbers. Also worth noting: Pittsburgh posted 395 yards of offense against the top-ranked defense in the league. Unfortunately, Ron Rivera's defense has given up a lot of scores through the air (tied for the eighth-most passing touchdowns allowed), but the unit has managed to compensate for that by forcing its fair share of takeaways (15). 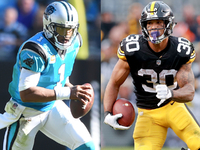 If Carolina can pull a few interceptions out of the bag against Roethlisberger, the Panthers should be OK. That's because Carolina has been strong against the run all year -- that is to say, James Conner is not likely to go off this week. Then again, Conner is on pace for over 2,000 scrimmage yards and 20 touchdowns.